I love it in the living room, but I did have a little 'painters remorse' moment after doing a whole wall in this room last night. Thankfully, I'm over the fear and now hope believe it will be fabulous when everything is done! I LOVE my doors now. LOVE LOVE LOVE! I must've taken 10 pictures of them this afternoon. On my lunch break. With my black dress pants dragging on the dirty, dusty floor. Hey, that's what those sticky roller thingys are for. Can you spot the other (sort of) big change? We actually had a good time painting together last night. Shaun even drew me this stick dude holding a olympic torch rose. Isn't he cute? So, what do you think about the color? Am I nuts? LOVE the dark color and how it makes the white trim pop. I used to be afraid of dark colors... but now the only color in my house that I don't like is the one light one. I am totally intrigued with the blue ceiling- I've resisted that idea when I've seen it on other blogs (ie. Young House Love), but yours really looks awesome! This looks awesome! 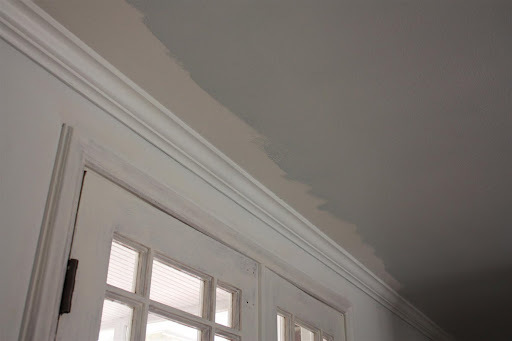 I'm trying to figure out which ceiling I can experiment with (I'm leaning toward the bathroom b/c none of our rooms have crown molding and that is the smallest!). I love the dark brown. Very cozy and crisp. I dig it!! 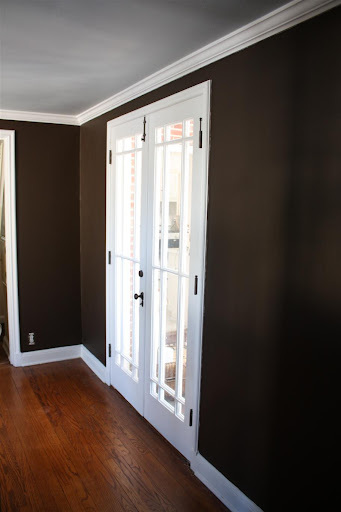 I think the dark color really works your doors let in tons of light. 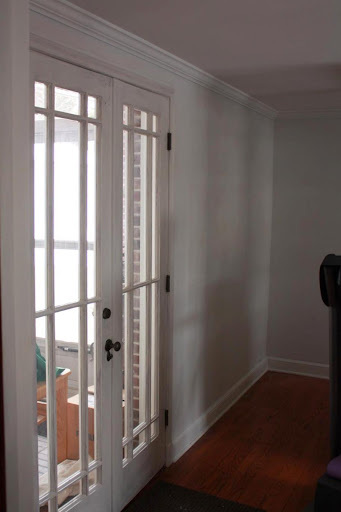 Plus it's a callback to the color in your living room. Total continuity. oooh, I love the blue ceiling! The brown is bold and it sure does make your doors look fabulous! 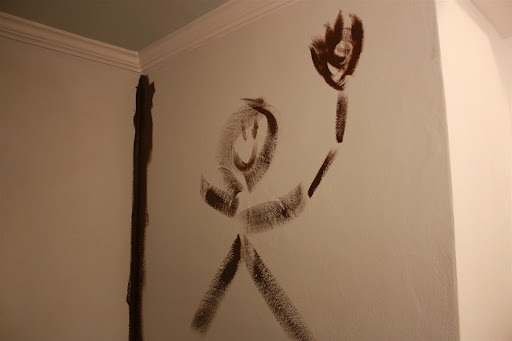 I can't wait to see how you finish this room. Looks Awesome!!! Chocolate is such a nice color - goes with everything! Love the ceiling too, you are braver than I to paint the ceiling other than white. Can't wait to see the rest! Love it! I'm glad you took the risk - the results are awesome. Love the ceiling color too. It looks delicious! Ugh, why did I have to give up chocolate for lent? 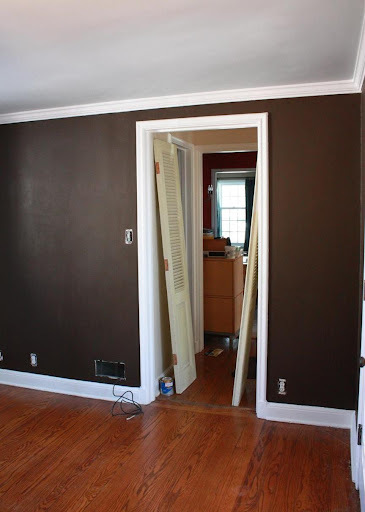 Hi Sara, I think the chocolate walls look great with the white trim, very classy. I can't wait to see how you accessorise the room I am sure it will look fantastic! I think it looks amazing! I love what you are doing with the ceiling, too!! That looks really good! 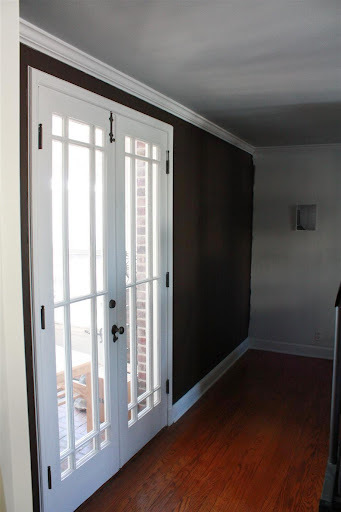 I can understand why you would be scared painting the room such a dark color, but it really does look great- especially with the pale blue ceiling! Can't wait to see how everything comes together! Confession: I don't like dark colors for walls. That being said, I was very surprised to love your navy blue room. And I love the other room that already uses chocolate. I think because of your other choices, you find ways to make dark colors perky. Sounds weird, but you know what I mean. Anyway, you've proved to me that it can be pulled off and you've pulled it off well, my dear! Excited to see the reveal!!! i like it! i also like to pull colors from other rooms to help bring everything together. i like the color on the ceiling too. It looks REALLY good. The colors make your trim pop so much and it looks really rich. Sara, this looks FANTASTIC! The perfect shade of chocolate... and that beautiful blue... set off by all that white trim... it's beautiful. And those doors!! All that hard work really paid off - they look amazing! I usually am not a fan of dark spaces, but this room looks very nice with the pop of white. I think the muted ceiling is a really cool contrast too. Thanks for making me think outside the box and be inspired by something different. I absolutely love the color! Paired with the ceiling color it is swoon worthy! Sara, it looks fantastic. I am loving the doors now! Thanks everyone! I'm so glad to hear the good comments. I'm really excited to accessorize the dark walls with some white accents, finally a place for all my mirrors that I've painted and not put anywhere! LOVE LOVE LOVE! I actually really enjoy all the bold use of color in all your spaces. It's wonderful and I love the ceiling! Love it! You are doing such great things. I can't wait to see whats next. Nope, no nuts here :-) It looks great. I like how you were daring and did blue on the ceiling. I kinda want to lick the chocolatey walls (I should probably go eat breakfast). Those doors let in a fabulous amount of light! Also, I'm with you on usually choosing white for the ceiling, but OH MY GOSH, isn't that blue-ish lovely? Is it me or does it have a gray undertone? Love the chocolate! Love the blue! I like that color a lot!! 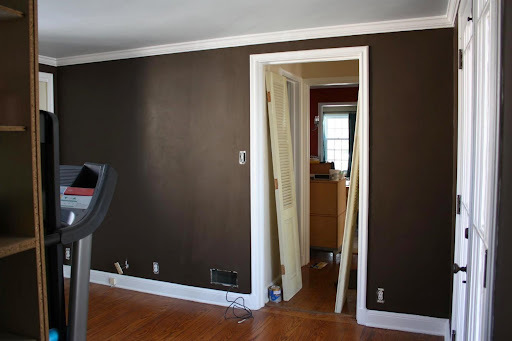 It reminds me of Behr Mountain Ridge, which we used in our upstairs bedroom. You are so NOT nuts! The chocolate is fabulous - YUM... I'm getting hungry. It makes those white doors pop like crazy too. I don't think you'll regret using the light blue on the ceiling either - That was a great idea! buterfly - glad you like it! You can contact me at russetstreetreno@gmail.com, or click the 'email me' button on the right sidebar. Now that that's out of my system, your chocolate walls are a feast for the eyes. So rich, such depth and so delectable! I can never say no to chocolate, so I vote yes all the way. And oh my word, where did you find that sunburst above the fireplace?